Above is Blue . Genetically Speaking, Blue is a Sorrel (ee) He does not carry a Creme Gene . According to A.P.H.A he is a Splashed White Overo He is a Giant 16.3 hands ! I purchased him as a Two year old strictly for riding . He has beautiful blue eyes , thus the name Blue He is the only horse I will ride now , I trust him with my life. He is so gentle ......... very small children have learned to ride on his back. He is the horse we throw ANYBODY on to when we have company . He was not part of my breeding program. I took this picture of him the first time a saddle was put on his bach . He reared up and it was "A Kodack moment "
Above is a picture of Buttercup the DAY BEFORE she foaled ! Then came my First foal with Two cream dilution genes (homozygous cream) He is a a "double dilute" a Cremello (CcrCcr ) JACK POT !! 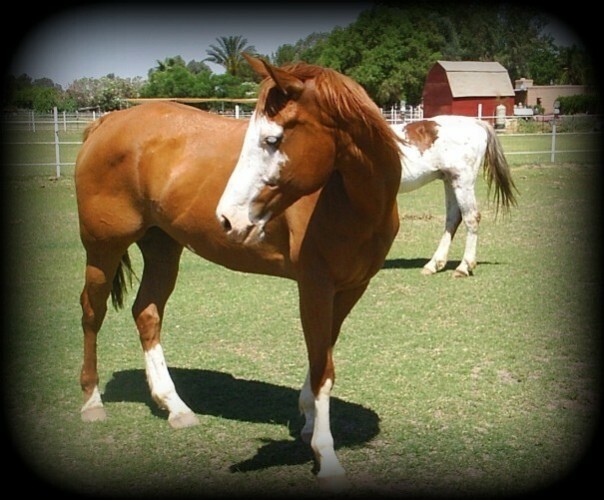 Triple Registered as "The Creme Stallion "
Two cream dilution genes (homozygous cream) has a "double dilute" effect on both red AND black hair on the horse's body and points. These horses are nearly white in color, though they may retain a golden cast, often with dapples. A bay or brown horse with two cream genes becomes a perlino; a chestnut horse a cremello; and a black a smoky cream. Homozygous cream dilutes all have pink skin and blue or bluish green eyes. Their skin may freckle in the sun. Every offspring of a homozygous cream dilute will be cream dilutes of some type. ....................Well there were other horses like The Thoroughbred Stud colt my father gave me , Cat, Coosa, Pretty Boy, Bear, Julie a pretty Paint , Zip, Jewell and her mother , , and others . But the ones that stood out in my life I listed above . Handsome Hay Burners LOL !